"The Cremains of the Day"
Now that I'm a "regular" at the annual Malice Domestic conference in Bethesda, MD, it's fun to submit to its annual themed anthology, published by Wildside Press. 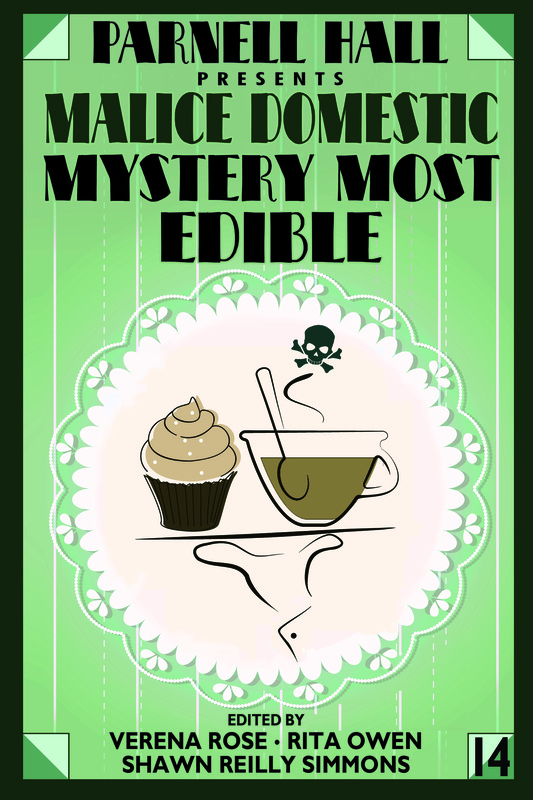 The theme for the 2019 volume was Mystery Most Edible, and I decided it was time to write something set in Iowa -- where I lived from August 2008 to May 2010 (with Laurie and Tessa there with me from November '08 to March '10). The story that resulted was "The Cremains of the Day," which I actually started a year or more earlier but never got around to finishing. Since the title is a pun, I decided that the main character should be a punster and the story should include a couple of additional puns and ultimately end with one. (Laurie really doesn't like it when I write a story only in order to set up a last-line pun, which I have in fact done before -- as, for example, with "Bill Posters Must Be Prosecuted.") I made my narrator a lady cop in Waterloo, and, since cops eat donuts and stories for this collection had to have something to do with food, made the food element the invented Bossa Nova donut from the invented Mojo Donuts, which I situated right next door to the real-world Cup of Joe on Main Street in Cedar Falls. You can order the trade paperback here.